My beloved Francies are finished! We’ve had a tough go of it, but we finally made it – and all in one piece (well, two pieces, but I’m really referring to the fact that I haven’t chopped these socks into little bits out of frustration). Third times a charm I always say, and it is the truth in this case. After knitting elf socks the first two tries (see previous post about delusion – I can convince myself that any work in progress is going to be fine, just fine no matter what evidence is presented to the contrary), I finally have created socks that fit my feet! Meet my Lightfoot Francies . . . 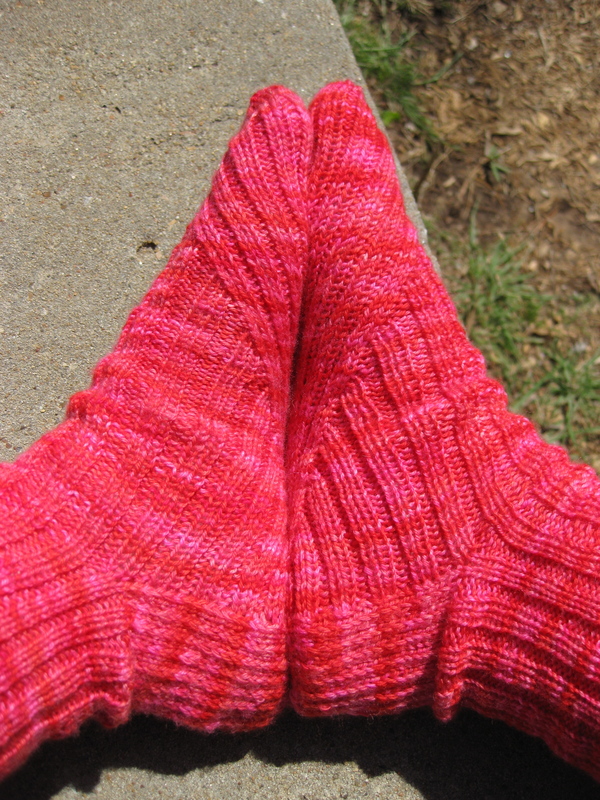 The socks are Francie by Rebekkah Kerner, and the pattern is very clever and beautiful. The foot shaping is really not as difficult as it looks (I omitted the leg patterning because it just wasn’t my thing), and the socks hug your feet just right. Don’t be afraid of the unique construction – just be afraid of your row gauge. Be very, very afraid of your row gauge. 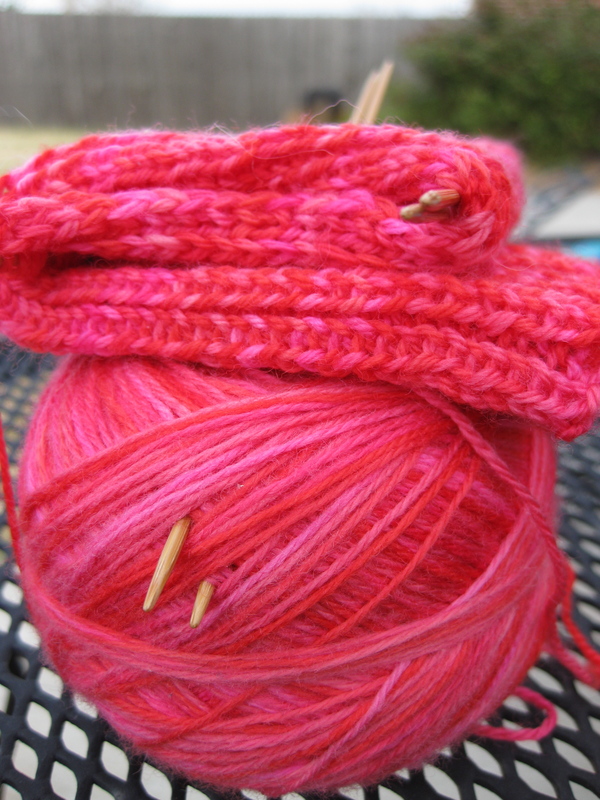 Ok, it’s not that scary, but apparently I am a very loose knitter compared to Rebekkah Kerner, so I had to make a needle change – specifically from 1’s to 00’s. As long as you’ve got correct row gauge, though, it should be easy, smooth sailing. The yarn is Slackford Studios, LLC Lightfoot Sock, colorway Favorite Lipstick, dyed by Susan right here in Oklahoma! This yarn is 100% superwash merino, and the yardage is great. It is super soft and lofty, and it doesn’t have too much twist the way I think some sock yarns do. 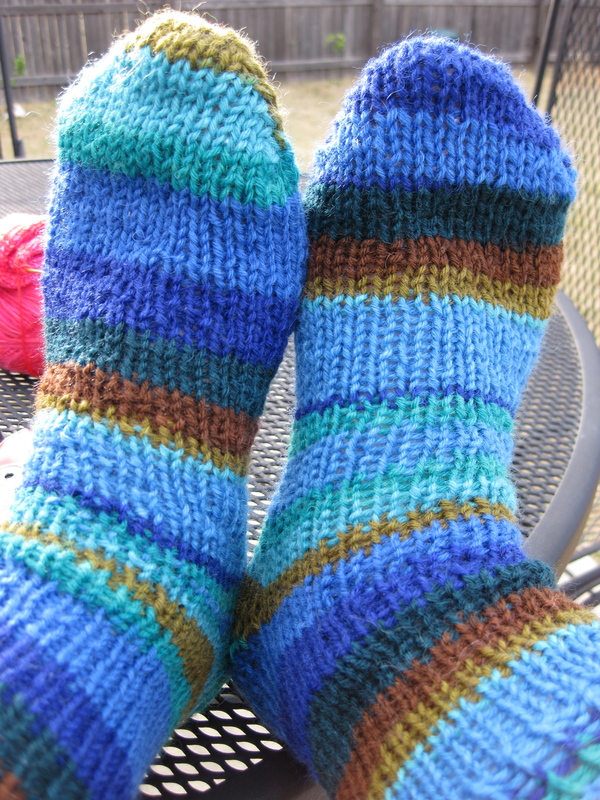 Lightfoot knits up really well – I didn’t have any problems with splitting or over twisting. It was also tough enough to withstand being ripped out approximately, oh, 50 million times and re-knit! I’m definitely going back to L&B for more soon! I’m in love with these socks and as soon as can psych myself up to knit on 00’s again I’ll be knitting some more! So, it’s the weekend now, and I’ve got my secret wedding present supplies! I’m about 20% finished, and I love it so far. I even took it into L&B to show off (and buy much needed needles) and convinced someone there to knit it as a wedding gift [not for Emily – don’t worry about duplicates :-)]! Don’t be concerned – I swore everyone there to secrecy before I left. Since I can’t really tell you much else about that project, let me share what I completed since last time. Plain-ole toe-up socks. 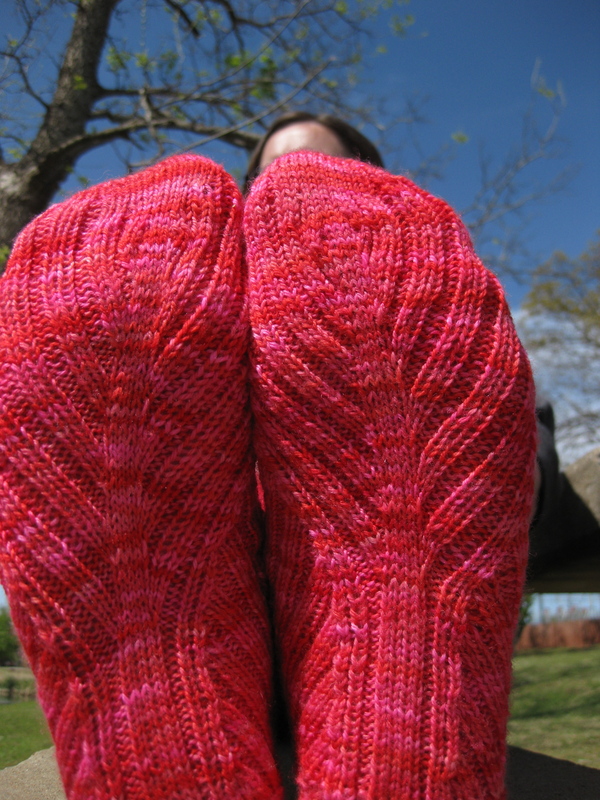 My Kaffe Fassett’s Design Line Universal Toe Up Socks are finished (they knit up really fast because the yarn is so big – well, big for sock yarn). I really love the colors and they fit great. After looking at more pictures of this yarn on Ravelry, I may have to make a few more pairs of plain-ole toe-up socks in different colorways. 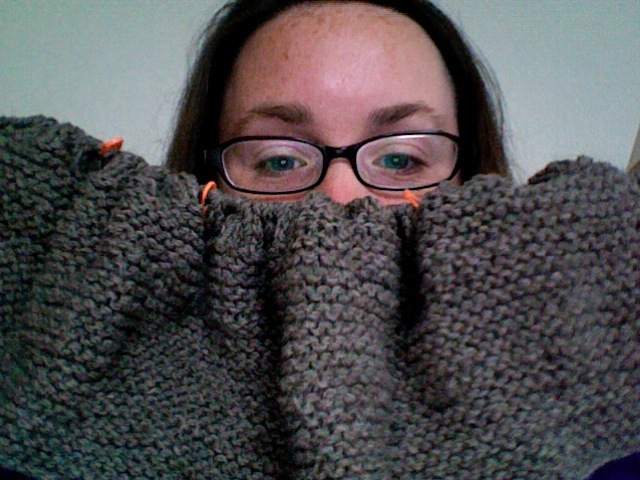 My second accomplishment was getting closer to row gauge for Francie than I have ever been! I’m well into the foot decreases on the first sock, and I’ll let you know if this story has a happy ending . . . In the meantime, please enjoy this picture of my Lightfoot Francies. I think the yarn is so beautiful in this photo that I have found myself looking at it over and over again! I look pretty cross-eyed in this one. I forgot to look at the camera and not the image on the screen! I’ll also show you a picture of some very cool sock yarn I bought at L&B tonight (when I stopped by to show off my sweater). I was sitting next to the spinner/dyer herself when Leslie showed me the yarn! It’s called Lightfoot Sock by Slackford Studio, LLC. I couldn’t find a link to the Slackford Studio website, but here is the spinner/dyer’s blog. 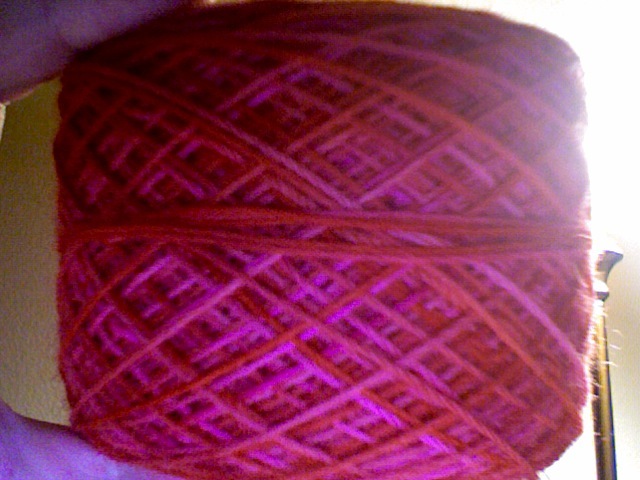 Although I haven’t started knitting yet, the yarn sure does look great all wound up! Maybe it will become a Clapotis (thanks to Leslie for telling me how to pronounce that – now I can discuss my potential project).